Our 60km Coast Ride is perfect for those riders looking for a challenge. Starting in the beautiful Bicentennial Park at Sydney Olympic Park, the ride heads south along the Cooks River cycleway. Showcasing some of the best of Sydney’s cycling infrastructure, the route makes its way south to the iconic beaches of Cronulla. Your adventure continues out from Cronulla along dedicated cycle lanes to picturesque Kurnell. Enjoy a bit of Australian history, some breathtaking coastline of Sydney’s south and a festival finish at Cronulla. • Age Limit: 12yrs and older, under 16 children MUST ride with paying adult. If you have not passed these points within the specified time, you will not be able to complete the ride under event conditions. • Waterview, Bicentennial Park, Start Site - Parking is limited and we recommend you leave your car at home. 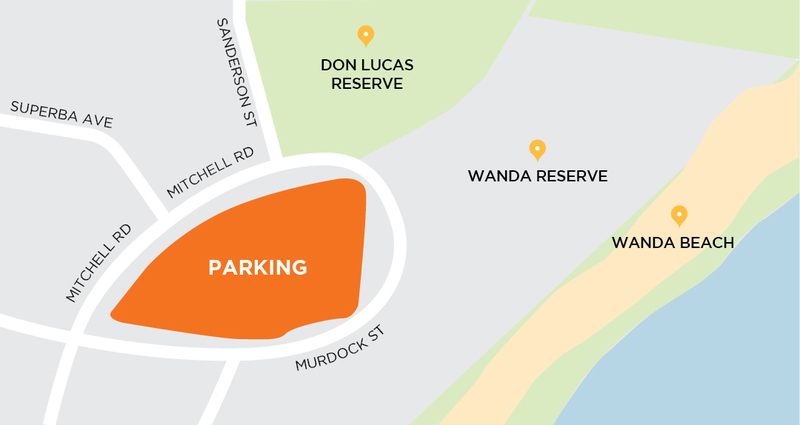 However if you plan to drive and leave your car at the start site, there is some parking around the start site at Waterview, Bicentennial Park. • Don Lucas Reserve, Finish Site, Cronulla - Parking is limited and we recommend you leave your car at home. However if you plan to drive and leave your car at the finish site, there is on street parking on Mitchell Road and Murdock Street, Cronulla.